Monmouth Canoe Centre01600 716083work CanoeingThe Monmouth Canoe Centre offer canoeing on the River Wye for families, youth and adult groups in Canadian canoes and single kayaks by the half-day or longer. Overnight canoe camping or B+B trips planned for up to a week's canoeing. Transportation service instructors available upon rquest. Also instructor led local caving, rock climbing/abseiling. Booking is essential. The centre has a have a large fleet of quality modern canoes and kayaks for hire providing canoeing trips to enjoy the River Wye and explore the stunning Wye Valley. From the Centre you can paddle your canoe up to 100 miles, from Glasbury, Hay-on-Wye, Bredwardine, Hereford, Hoarwithy, Ross-on-Wye, Kerne Bridge at Goodrich, Symonds Yat or Monmouth as far as Tintern or guided, to Chepstow where the Wye meets back up with the River Severn after their birth together in the Welsh mountains. The Monmouth Canoe Centre offer canoeing on the River Wye for families, youth and adult groups in Canadian canoes and single kayaks by the half-day or longer. Overnight canoe camping or B+B trips planned for up to a week's canoeing. Transportation service instructors available upon rquest. Also instructor led local caving, rock climbing/abseiling. Booking is essential. 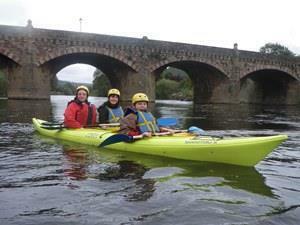 A range of courses or guided river trips is also available.